There is nothing you can do to completely stop the aging process, but there are things you can do to slow it down or to reduce the appearance of aging. Visible signs of aging like fine lines and wrinkles can be a major source of frustration, but with the proper skin care and makeup tools and techniques, you can seriously diminish the appearance of fine lines and wrinkles. Keep reading to find out what products, ingredients and steps you should be including in your effort to diminish the appearance of fine lines. Exfoliate Regularly – Exfoliating is an important part of an anti-aging skin care routine, because it removes the dead skin cells that clog up the surface layer of your skin. When these dead skin cells accumulate, your skin looks tired and dull, which emphasizes any fine lines and wrinkles you have. Alpha-hydroxy acids, like glycolic or lactic acids, are an excellent way to gently slough away the buildup of dead skin cells and other debris. Aim to exfoliate once or twice a week to keep your skin looking healthy and radiant, which will go a long way in reducing the appearance of fine lines. Use Retinol – Retinol is an anti-aging superstar and it is frequently endorsed by dermatologists for its ability to diminish the look of fine lines and wrinkles. In addition to helping reduce the appearance of fine lines and wrinkles, retinol also helps your skin look more even and it helps reduce the appearance of hyperpigmentation. Uneven skin tone in conjunction with hyperpigmentation and fine lines result in an old-looking face, and retinol can help to turn back time and give your skin a more even, firm and glowing appearance. Moisturize – Your skin needs moisture and the older you get, the more moisture it needs. Be sure to apply moisturizer twice a day and look for one with hyaluronic acid. Hyaluronic acid draws moisture out of the surrounding air and pulls it into your skin. When this happens, your fine lines are “plumped” up and are far less significant looking than before using a moisturizer. Moisturizing is also an absolute must before you move on to your makeup routine. Properly moisturizing your face helps your makeup to glide onto your skin smoothly and to eradicate dry, rough patches of skin that your makeup may cling to. Use a Primer – If you think primers are just marketing hype, you will want to reconsider this notion. Effective primers help your makeup apply evenly, blur fine lines, wrinkles and pores and help you achieve a more flawless makeup look. As you age your makeup tends to settle into fine lines or pores which result in exaggeration of your signs of aging. Primers add an extra layer of protection between your face and your makeup and essentially “fill in” your fine lines. To further reduce the appearance of fine lines, look for a primer that has light reflecting particles to add a natural radiance to your skin. 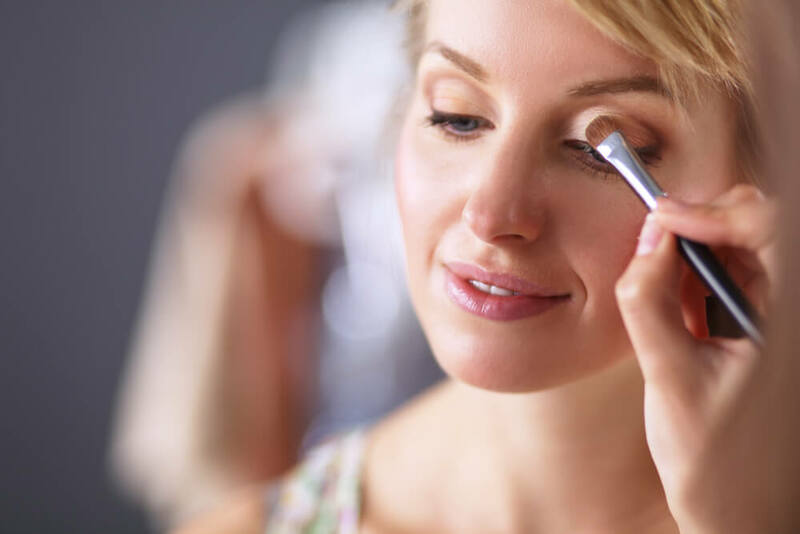 Skip Powder – Powders are ubiquitous in the makeup world, but as you age you may want to start phasing powders out of your routine. A very lightweight translucent powder is still great for setting your foundation and a powder that contains light reflecting particles can have a brightening effect, but proceed with caution. Powder foundations and pressed powders have a tendency to settle into your fine lines, so if you continue to use a powder, use it very lightly and only on areas where you absolutely need it, like your T-zone. Pick Foundation Carefully – In addition to getting rid of your powder foundations, you want to look carefully at the liquid formulas you use as well. It can be tempting to reach for maximum coverage if you want to hide your age, but doing so can end up backfiring. Less really is more as you age, and you might want to swap your full coverage foundation for something lighter. Tinted moisturizers, BB and CC creams are all great options for aging skin because they provide coverage, but also soothe and moisturize aging skin. The proper skin care routine and makeup products can significantly impact the appearance of fine lines and wrinkles. Use these ingredients, products and tips to help reduce signs of aging and to achieve a more radiant and youthful-looking face.